Only GWO certified training providers who fulfil the requirements of the GWO Criteria for Training Providers are eligible and in turn required to use WINDA. For training providers, WINDA has one primary function, which is to upload training records of delegates who have passed a GWO training module. WINDA can also complement existing management systems to keep track of delegates' training by verifying their training status. Training providers can upload records in the GWO safety training standards to which they have been certified. All data entered into WINDA must be in English. If you are expecting to upload multiple records, we recommend using the bulk upload option. The bulk upload function uses a CSV. file format and you will be able to download a standard template, fill it out and upload records into WINDA. If you need to upload and search for large amounts of records you can choose to do so through an API. All training that is completed on October 17, 2016 and onwards must be uploaded into WINDA. No historical records will be added to WINDA, as all delegates will have their new/refresher training records added to WINDA within two years after launch. The WINDA ID is the delegate’s unique identification number. All delegates must provide their WINDA ID prior to leaving the training provider, if they wish to have their training accepted by GWO. In order to comply with international data protection and privacy rules, the delegates themselves will have to create a profile in WINDA in order to receive a WINDA ID. The process is automated and instantaneous and the same WINDA ID follows the delegate through their career in the wind industry. The WINDA ID is a unique random and system generated number which serves as the main delegate identification. It is therefore important that all parties are made aware of the importance of this ID and that it will be requested by training providers and organisations who may need to access and search the delegates’ training records. You must pre-purchase credits in order to upload records into WINDA. Credits can be purchased in WINDA when you are logged into your WINDA profile. One credit equals one record upload. The fee for credits is set by the GWO Steering Committee. The current fee is set at 10 Euro per credit. You need to register as a Training Provider at winda.globalwindsafety.org via the “Register” option. 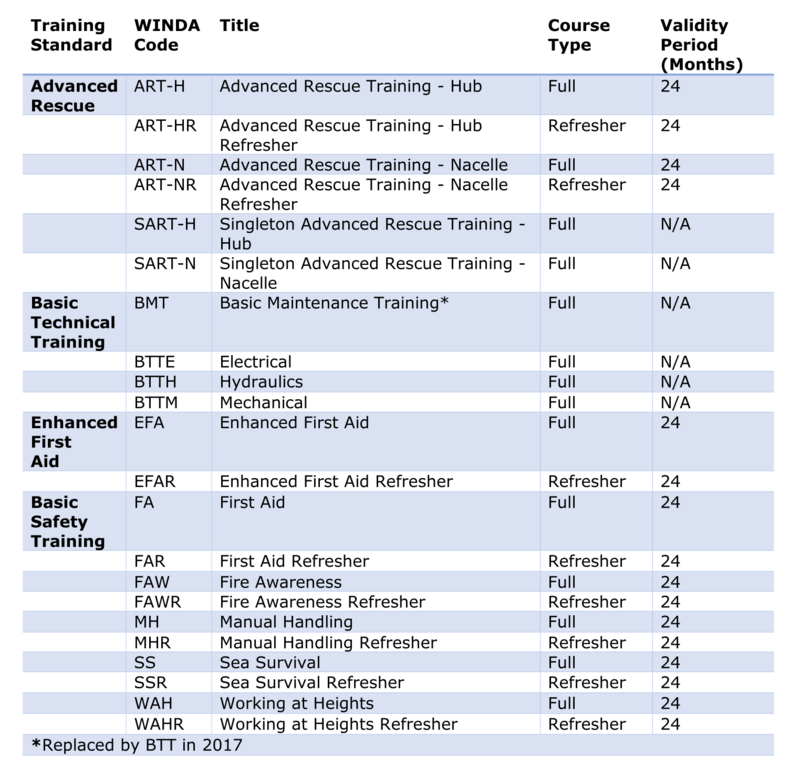 Choose to be registered in WINDA as a Training Provider and fill out the required information including the attachment of your GWO certificates in a PDF format. Once your application has been reviewed and you have been verified as a GWO certified Training Provider, you will be sent an e-mail requesting you set up the account. This will include confirming details of the Training Provider's administrator. You must only register one Training Provider account for each training site in WINDA. If you have multiple Training sites, each site must create their own WINDA account and purchase their own credits. The Training Provider administrator can invite other users to the Training Provider's WINDA account and when doing so, choose their access and abilities in WINDA, such as whether or not a particular user is allowed to upload records and purchase credits. Only GWO certified Training Providers that have a certificate on file at the GWO secretariat and has paid the annual licensing fee will be granted access to upload records into WINDA. ‍If you are not active on your account for 24 months your account will expire. You will automatically be notified in advance when your account is about to expire. Please log in to your account on a regular basis to avoid expiry. GWO will not be able to reactivate expired accounts. As a GWO certified Training Provider, you are responsible for informing your internal administrators, who may have responsibility for bookings and uploading records, as well as your customers. You are best placed to know how and when to inform your customers – but you are encouraged to inform them at the time of booking about WINDA and that they need to register in WINDA as a Delegate and provide you with their WINDA ID. WINDA is free to use for Delegate and Organsation users. Training Providers are subject to pay applicable fees. The Annual Licensing fee is set at 650 Euro per certified training site. Training Providers are required to upload a training record when a Delegate has completed a training module. The training record must be uploaded using prepaid credits in WINDA. The fee is set at 10€ per credit – one credit is needed to upload one record of training for one Delegate having completed one module. If one delegate completes 5 modules, you will need 5 credits. For every purchase of “pack of 100 credits” a 4% discount applies. The fee will remain at 10€ for all of 2017, with 4% discount given to “pack of 100 credits”. Any changes to the fee level will be communicated at least three months in advance. As GWO is not-for-profit, it is the policy to provide the WINDA service at as low costs to industry as possible. Training Providers who wish to receive an invoice instead of purchasing credits by credit card can become eligible to do so if you purchase 500 credits or more. A 4 % discount will be applied to orders larger than 500 credits. As described in point 7.4 in the WINDA Terms & Conditions, Training Providers must not have any outstanding debt to GWO. If you want to purchase 500 or more credits and receive an invoice, please write to info@globalwindsafety.org, including your company name, VAT number and desired number of credits. You are welcome to place an order in advance of registering for your Training Provider account. The Annual Licensing Fee is invoiced. Credits in WINDA are purchased by credit card. The following credit cards are accepted in WINDA.